Good morning. We hope everyone has a safe and enjoyable New Year’s Eve today and tonight. There have been a lot of questions about how cold it’s going to get, whether it’s going to snow or ice and what to expect over the next few days. So, we’ll set out to answer those questions for you this morning! Right off the top, we do expect hard freeze type conditions in most of the area at multiple points over the next several days. 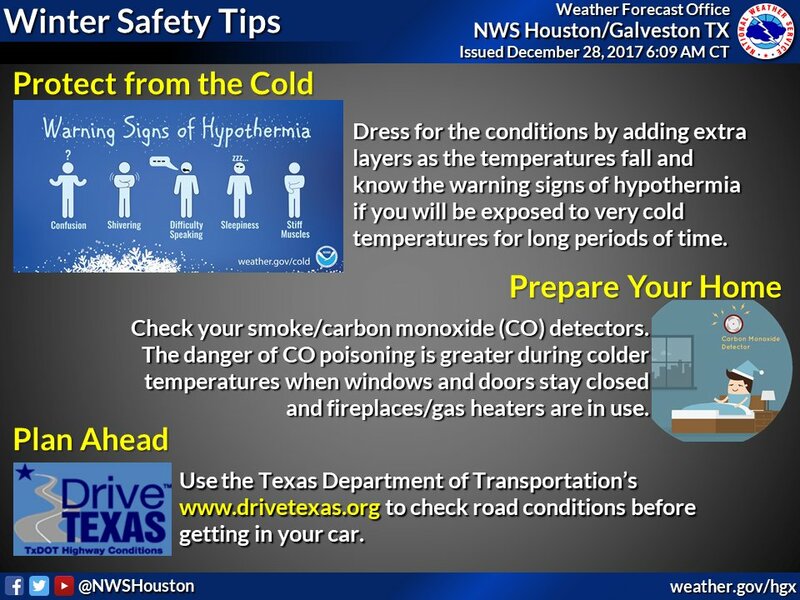 If you need tips or advice on how to prepare for cold weather, here’s some info from the city of Houston. I grew up in the Northeast, where we’d laugh about getting worked up about low temperatures in the low or mid-20s. Turns out, cold of that level can indeed be quite damaging here. If you’re new to the area, I can tell you from experience, it’s smart to go through the checklist and do what you can. It’s a gray, drizzly morning, and that probably won’t change a ton as the day goes on. We may see a bit less drizzle later this afternoon or evening. Temperatures today aren’t going to be any warmer than they are right now. We’ll stay steady in the mid or upper-40s, slowly dropping back toward evening. Upper-30s arrive in the Brazos Valley by late afternoon. Winds will gradually increase through the day today too. Expect gusts of 20-25 mph today. But bottom line here: No travel issues are expected during the day in Houston. If you’re headed north, there are icy spots reported west of I-35 and north of I-20, mainly in the Panhandle and up toward the Red River. 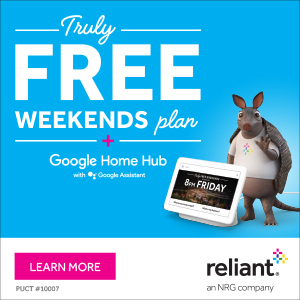 If you are traveling out of Houston today, I’d strongly suggest you check DriveTexas.org for the latest. Winds will continue to howl and temperatures will continue to drop. By Midnight, temperatures in the city of Houston will likely be down to about 34-36° north of I-10 and 36-38° south. Up toward College Station, it’ll be at or below freezing by Midnight in all likelihood. Same goes for areas around Conroe or Huntsville. Some wet roads may have patchy black ice on them, so if you will be out returning from holiday festivities or commuting late, use extra caution along and north of Hwy-105. In and around the city of Houston, we do not expect any travel issues even after midnight. Overnight, it gets colder. 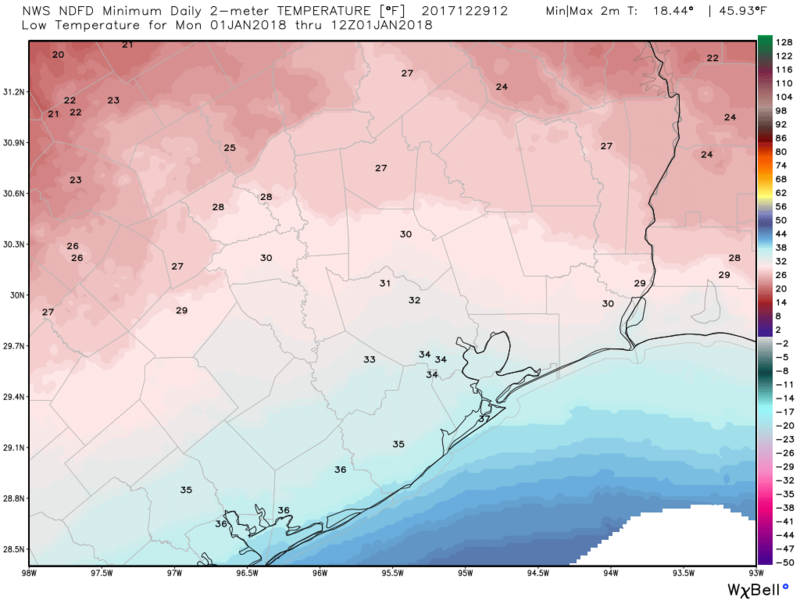 Expect low temperatures on Monday morning around 30° in the city of Houston proper and near freezing in Galveston. North of Houston, it gets more into hard freeze territory, and indeed Hard Freeze Warnings are posted for Liberty, Montgomery, Walker, Grimes, and San Jacinto Counties tonight. 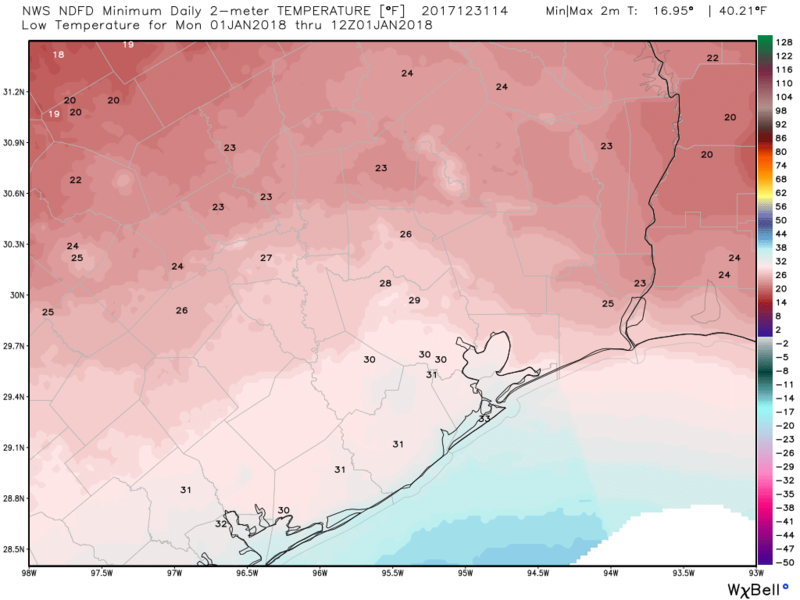 We should see lows in the upper-20s in The Woodlands and mid-20s in Conroe. Further north, we could do low-20s in spots in the Brazos Valley or up toward Huntsville. Same goes for East Texas north of Beaumont. In addition, we’ll still have some wind, so expect wind chills down to around 15° in Houston and colder in spots north of Houston. Take extra steps to secure any coverings for sensitive plants as well to ensure you can lock in as much ground warmth as possible. If you’re heading out tomorrow morning, bundle up. Out with the old, in with the cold. This weekend, we will bid farewell to a 2017 that will end up as Houston’s warmest (likely) and wettest (definite) on record. 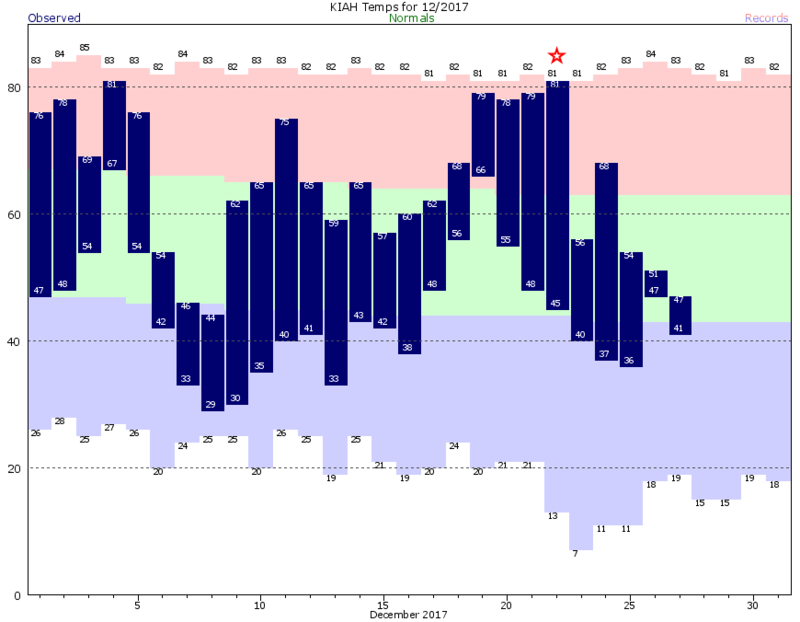 2018 will subsequently start as one of Houston’s coldest on record. Start making some plans now to protect the four P’s: People, pets, plants, pipes. It’s likely going to get cold enough next week in most of the region that you’ll need to take action on at least one night, if not multiple nights. First, let’s look at the weekend. No serious weather issues are anticipated the next couple days. That said, there’s a couple things to track. Clouds are likely to dominate the picture again today. There will be some drizzle or mist around this morning, particularly south and east of Houston. Onshore flow begins in earnest later today and tonight. That means a couple things. First, we might see more drizzle in spots and perhaps even a few showers (mainly Saturday near coastal locations). Second, fog will probably reappear in the area. I think coastal fog is possible tonight into Saturday, with perhaps even some inland as well. Saturday just looks kind of dreary with clouds and some showers or drizzle around. Temperatures today will warm into the upper 40s to low-50s. It’s possible that temperatures don’t drop at all tonight, and Saturday will see temperatures warm further into the lower or middle 60s in Houston. It could be a degree or two warmer south or a little cooler north. So the first part of the day will be mild and cloudy. We’ll likely have fog in spots, and a few showers will be possible throughout the day. We should top off in the upper-50s to around 60° or so for highs. A cold front is on track to plow through at some point Sunday afternoon or evening, give or take a few hours. That will send temps down into the 40s for evening festivities. After Midnight, we’ll drop into the 30s everywhere. So if you’re heading out to celebrate, the weather you experience on your way out the door may not be anything like the weather you’ll experience when you’re coming home. We don’t see a lot of risk of ice or frozen precipitation in Houston proper Sunday night. But these situations can be a bit fickle, so you’ll probably want to pay attention to the forecast for late Sunday night if you’ll be out traveling. If you will be up north (think Brenham-Conroe-Cleveland), it’s more likely that you could see some freezing drizzle after midnight. With a possibly damp day, some black ice will be possible on the roads up north too, even if there’s no freezing drizzle. So just exercise extreme caution in northern areas and pay attention to the weather in southern areas Sunday night if you’re going to or fro. If something changes significantly, look for us to update you Sunday morning or afternoon. On Friday, Dec. 22, Houston’s high temperature reached 81 degrees. Since then a series of cold fronts have kept highs below 70 degrees—and it seems unlikely that the high temperature will reach 70 again at least for the next week to 10 days, if not quite a bit longer. We truly are in the depths of winter, and it looks as though we’re only going to get colder in the days ahead. For most of us, the drizzle is probably over for the next couple of days. However, skies will remain mostly gray—there’s a chance of some patchy sunshine on Friday—and this will confine high temperatures to the upper 40s or lower 50s. Lows will be about 10 degrees cooler as clouds prevent radiational cooling at nighttime. An onshore flow resumes, briefly, on Saturday. Effectively this means the region will see some warmer weather, with highs likely in the low- to mid-60s. With this, some rain chances will return, especially during the afternoon and evening hours. Accumulations should be slight, regardless. For the month of December, Space City Weather has been sponsored by The Law Office of Murray Newman. This means the site was provided for free, without advertising, for the entire month thanks to Murray. 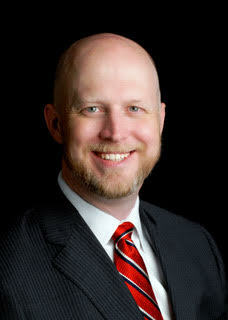 I’m a former Felony Chief Prosecutor who practices Criminal Defense in Harris County and the surrounding areas. I’m an 1995 graduate of Texas A&M and a 1999 graduate from the University of Houston Law School. I represent people accused of crimes, both misdemeanor and felony. I’m a trial lawyer who doesn’t back down on even the toughest of cases. Thank you to Murray for supporting the site this month!